Definition at line 54 of file scrollzoomer.h. Definition at line 58 of file scrollzoomer.h. Definition at line 151 of file scrollzoomer.cpp. Definition at line 164 of file scrollzoomer.cpp. References d_cornerWidget, d_hScrollData, and d_vScrollData. Definition at line 301 of file scrollzoomer.cpp. Definition at line 306 of file scrollzoomer.cpp. References d_cornerWidget, d_hScrollData, d_vScrollData, layoutScrollBars(), and ScrollData::scrollBar. Definition at line 194 of file scrollzoomer.cpp. Referenced by layoutScrollBars(), and updateScrollBars(). Definition at line 231 of file scrollzoomer.cpp. Definition at line 268 of file scrollzoomer.cpp. Definition at line 504 of file scrollzoomer.cpp. References d_cornerWidget, ScrollBar::extent(), horizontalScrollBar(), hScrollBarPosition(), oppositeAxis(), OppositeToScale, verticalScrollBar(), and vScrollBarPosition(). Referenced by eventFilter(), and updateScrollBars(). Definition at line 345 of file scrollzoomer.cpp. References d_hScrollData, d_vScrollData, and ScrollData::mode. Definition at line 587 of file scrollzoomer.cpp. Definition at line 171 of file scrollzoomer.cpp. Definition at line 177 of file scrollzoomer.cpp. 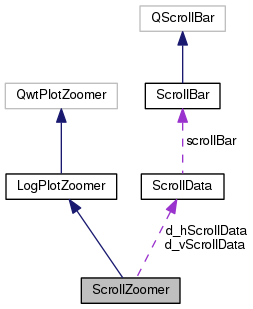 References d_hScrollData, d_vScrollData, if(), ScrollData::scrollBar, and scrollBarMoved(). Definition at line 577 of file scrollzoomer.cpp. Definition at line 278 of file scrollzoomer.cpp. Definition at line 205 of file scrollzoomer.cpp. Definition at line 250 of file scrollzoomer.cpp. References d_hScrollData, ScrollData::position, and updateScrollBars(). Definition at line 218 of file scrollzoomer.cpp. Definition at line 259 of file scrollzoomer.cpp. References d_vScrollData, ScrollData::position, and updateScrollBars(). Definition at line 401 of file scrollzoomer.cpp. References d_cornerWidget, ScrollBar::extent(), horizontalScrollBar(), hScrollBarPosition(), layoutScrollBars(), ScrollBar::moveSlider(), needScrollBar(), oppositeAxis(), OppositeToScale, scrollBar(), ScrollBar::setBase(), ScrollBar::setInverted(), ScrollBar::setLogScale(), verticalScrollBar(), and vScrollBarPosition(). Referenced by rescale(), setCornerWidget(), setHScrollBarPosition(), and setVScrollBarPosition(). Definition at line 199 of file scrollzoomer.cpp. Definition at line 241 of file scrollzoomer.cpp. Definition at line 273 of file scrollzoomer.cpp. Definition at line 109 of file scrollzoomer.h. Referenced by cornerWidget(), eventFilter(), layoutScrollBars(), setCornerWidget(), updateScrollBars(), and ~ScrollZoomer(). Definition at line 111 of file scrollzoomer.h. Referenced by eventFilter(), horizontalScrollBar(), hScrollBarPosition(), needScrollBar(), scrollBar(), ScrollZoomer(), setHScrollBarPosition(), and ~ScrollZoomer(). Definition at line 112 of file scrollzoomer.h. Referenced by eventFilter(), needScrollBar(), scrollBar(), ScrollZoomer(), setVScrollBarPosition(), verticalScrollBar(), vScrollBarPosition(), and ~ScrollZoomer().